Heidi Angell has visited the blog before - but here she stops by as she counts down to the launch of the second book in her Hunters Saga. She calls by to talk of things that go bump - and bite - in the night. Here's Heidi, sinking her teeth into the subject of... vampires! Vampires have woven their tendrils deep in the human psyche and in human history. Some version of vampires can be found in nearly every culture throughout the world. The ancient Mesopotamians, Greeks and Hebrews had legends of demon spawn or evil spirits feeding on human life force. In India there were ancient tales of ghoul-like creatures who would inhabit the bodies of the dead and drank the blood of the living. In China and Tibet, there were beliefs of evil spirits and deities who consumed human life force. But the reanimated humans who drink blood and turn others into vampires became a fascination in Europe during medieval times. the strigoi of Romania, the Shtriga of Albania, and the vampire of western Europe. In these tales, the descriptions were a bit different from our modern vampires. More reminiscent of zombies with bloated decaying bodies, ruddy from blood-letting, and creeping in shrouds. 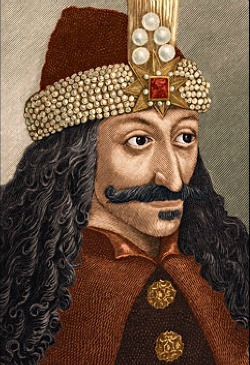 They were probably based on the stories of real-life monsters like Vlad the Impaler and Countess Elizabeth of Bathory. The modern vampire of pallid skin, charisma, and sophistication gained ground in the 1800s with the publication of novels such as Dracula (based on Vlad the Impaler). That image has clung to our imagination, developing and adapting into the vicious yet tragic characters of Anne Rice’s Vampire Chronicles, to the Dangerous yet enlightened vampires of Stephanie Meyer’s Twilight series and Richelle Mead's Vampire Academy, and on to the romantic heart throbs of True Blood and Vampire Diaries. I love every version of vampire, but I grew up with The Lost Boys and Dracula. I found the ancient monsters fascinating and terrifying. Beautiful in their apex predatory nature, but still terrifying! I can understand why people would fall in love with vampires. I love lions, wolves, tigers, sharks and cougars. They are all beautiful, elegant, predatory kings. But I can’t fathom one falling in love with me! I wanted to get back to the monsters, the predators who feed on humans like we feed on cows. And I imagined that someone would need to protect human cattle from these brutal killers. The Hunters Saga was born! The Hunters Saga is an urban fantasy/ horror series for those who believe vampires should be killed, not kissed. In the first book, we meet a group of young adults whose town has been infested by vampires, and who meet Fury and Havoc, vampire hunters who have tracked a vampire to their town. These hunters help rid the town of vampires, revealing their true forms along the way. 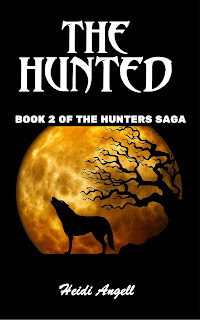 In the second book in the series, The Hunted, which releases February 18th, Fury, Havoc and Screvin track down a werewolf who turned Screvin in The Hunters, to help her understand what she is and how to cope so that she stops harming humans. But they learn that the Supernatural Counsel is looking for her as well, and the hunters have now become the hunted. We are having a huge party to celebrate the launch of The Hunted. Come and join us in some awesome stops on the tour, including a Facebook launch party the weekend of February 17th-19th where there will be games, giveaways and goodies! Thanks for having me! Always a pleasure. If anyone has any questions, let me know. I'll be here all day. Glad to have you by, Heidi! Hope the rest of the launch goes well. Come by and chat anytime!